Hi everyone! 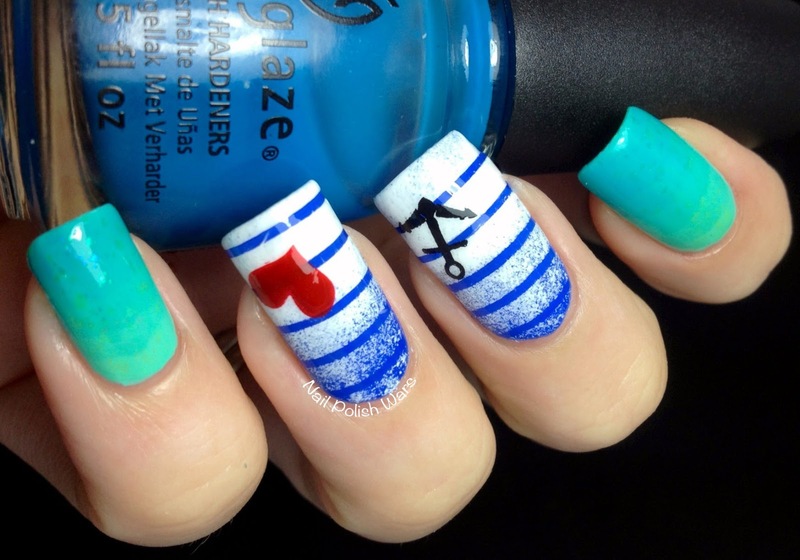 I felt like doing something a little nautical today. I think the realization that summer is winding down is getting to me, so I'm trying to hold on to it as long as I can!! I started off with two coats of China Glaze Too Yacht to Handle on my index and pinky fingers, and two coats of Sally Hansen Pacific Blue on my middle and ring fingers. I followed with one coat of SV. I used the syrup gradient method with China Glaze Isle See You Later over Too Yacht to Handle for a sea glass look. 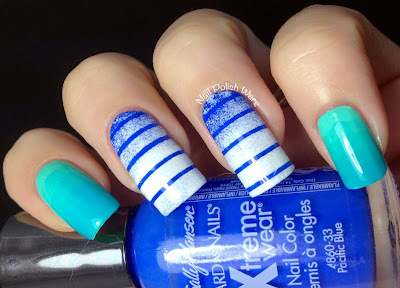 I placed striping tape horizontally over Pacific Blue and sponged on Adore Nail Polish To Have and To Hold for a faded nautical stripe look. I followed with one coat of SV. 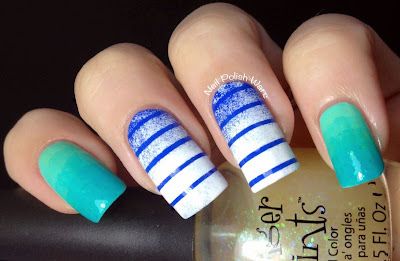 To add a little something to the sea glass look, I added two coats of Finger Paints Motley, followed by one coat of SV. I paired Konad Special Black with Bundle Monster plate BM08 for the anchor design, and Konad Special Red with Red Angel plate RA-120 for the heart design, and finished with one coat of SV. I love the end result! It feels so fun and sea worthy! The sponging over the striping tape really makes me think of sea spray as well!! 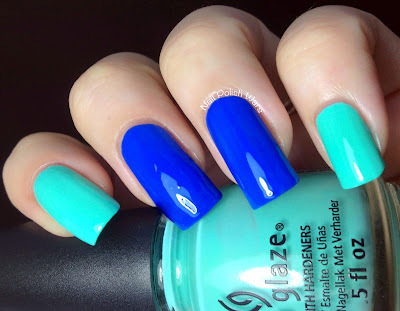 I really hope you enjoyed today's mani!! Happy Painting! 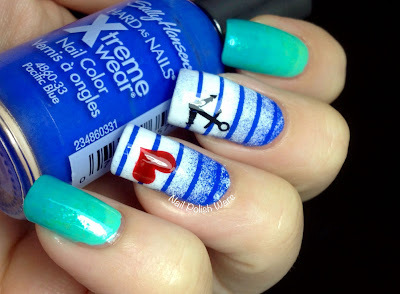 I'm a nautical girl at heart, & these are truly adorable! Aww so cute! 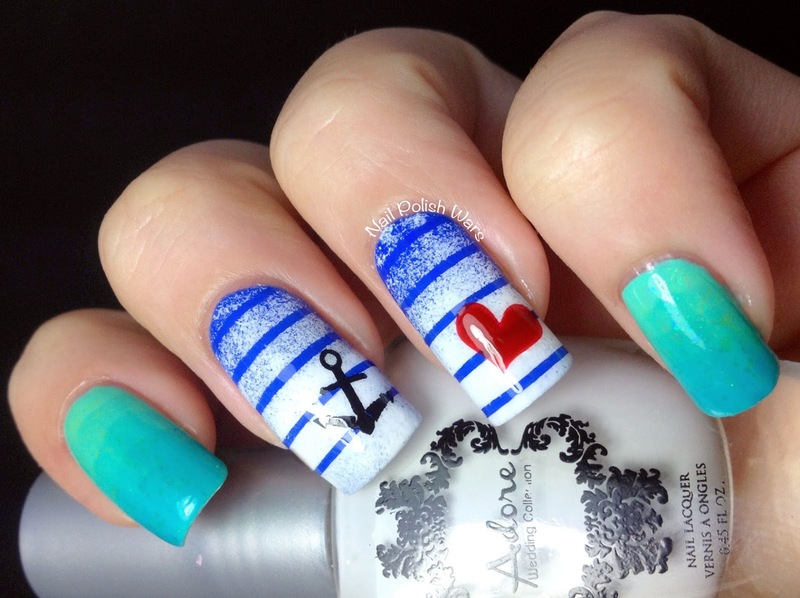 I need to try a nautical theme manicure now. Holy moly this is perfect! Love every aspect of it! So gorgeous!! The gradient was a nice choice! 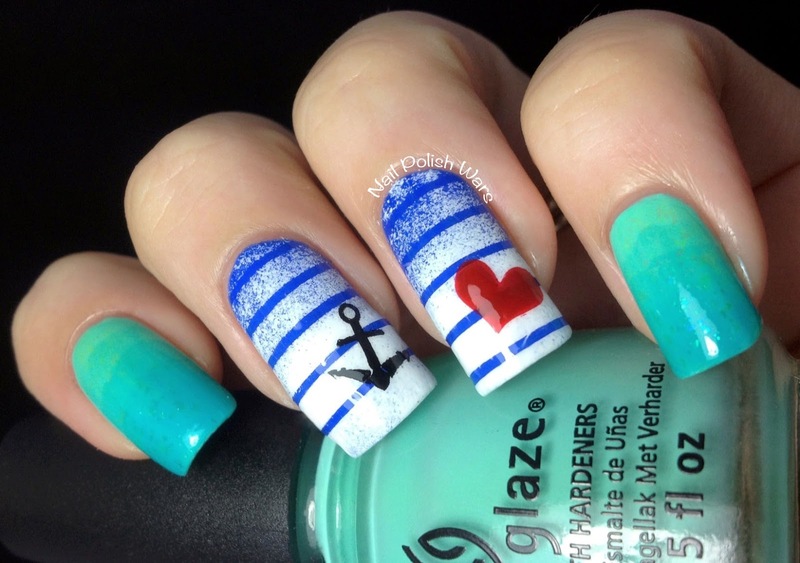 I love those middle two nails! The stamped little heart is so cute! I like this a lot :).